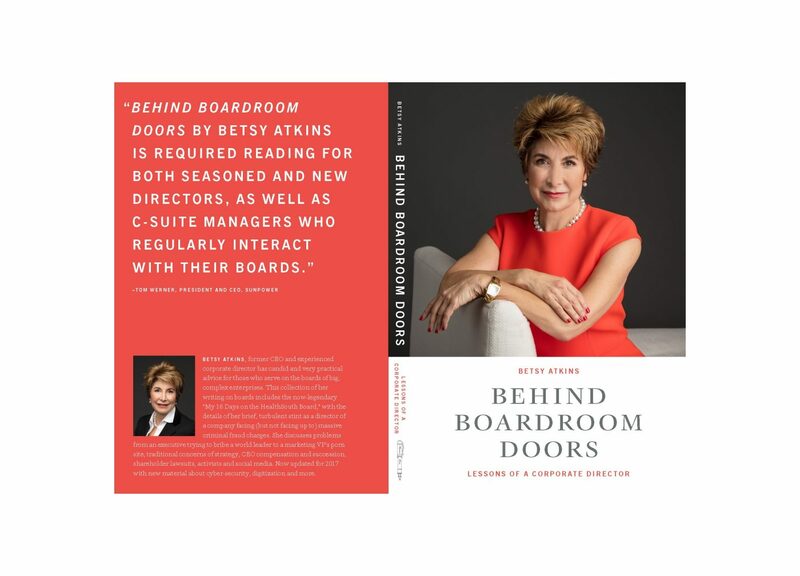 Betsy Atkins is sharing her decades of experience as a corporate director in the third edition of the instructive and engrossing book, Behind Boardroom Doors: Lessons of a Corporate Director. SFBW readers may be familiar with Atkins from some of her recent guest columns. The Coral Gables resident serves on the boards of Cognizant, HD Supply, SL Green Realty and Schneider Electric. She is also a member on the board of Volvo Cars and the SAP Advisory Board. Just as important, though, Atkins brings experience as a three­ time) CEO, a serial entrepreneur and the founder of Baja Corp., which built three early stage funds and made early investments in Yahoo and eBay. While the book’s title might indicate it is written for directors, it has a lot of insight on how CEOs and other C-suite executives can best interact with their boards. There’s a lot of discussion about the roles of boards versus executives. “Board members have oversight responsibility for strategy and may contribute input. The critical delineation is that management owns, operates, and implements strategy,” Atkins writes. Boards represent shareholders in making sure strategies are robust not just for the short term, but the long term, which may be an even more critical responsibility. The most gripping chapter in the book is “Crisis Management.” Atkins experienced what she calls every director’s nightmare: Joining the board of a company just before it was hit with massive criminal fraud accusations. The company in question was HealthSouth. On March 19, 2009, Atkins wrote in her diary that the day started off regularly, but then she got word that the Securities and Exchange Commission had filed civil fraud charges against HealthSouth and Chairman and CEO Richard Scrushy. With Scrushy’s chairman role -compromised, Atkins stepped into the lurch as chairman of the special litigation committee and organized a series of rapid-fire board meetings that day. It culminated in a 7:30 p.m. meeting about whether Scrushy should be removed, who would be chairman and who would become CEO. Readers will find a surprising twist in what prompted Atkins to leave the company after only 16 days amid all the turmoil. While Atkins also draws from lessons at other companies she served as director, including the tech meltdown that slammed Lucent Technologies, she also looks at how other companies handled problems, such as the publicity from a passenger being dragged off a United Airlines flight and BP’s disastrous oil spill in the Gulf of Mexico. Atkins spends time in the book talking about directors’ role in hiring and firing of CEOs. One key piece of advice: “When you start to think there is something amiss, go and investigate it actively.” Too often, when the board gets a whiff of problems, the rest of the company is fainting from the smell, she writes. Atkins also has insight into board dynarnics, such as handling rogue directors and avoiding coup d’etats led by directors who just want the CEO’s job. Atkins give logical approaches for board diversity (it’s as much about skills and background as it is about gender and race) and how to keep boards from going stale. There’s a way to be graceful in moving out board members who might have been great in their day but need to be replaced with someone who brings critical skills. Atkins also gives a lot of attention to critical corporate issues, such as the pace of technological change and cybersecurity. Atkins book is well timed because news headlines these days offer a steady stream of companies and directors in crisis. The third edition of the book has fresh examples of trends, trouble and how directors can prepare for them.